Over at Serious Eats today, I wrote of the Afternoon Tea Service at Lady Mendl’s on Irving Place. I spend a lot of time in this area of Gramercy, home to favorites such as Casa Mono, Maialino and One Lucky Duck. Lady Mendl’s is tucked in the middle of this all, the tea room occupying one half of the parlour floor of a bed & breakfast, the Inn at Irving Place. Step right in and it’s like you left the city behind. I enjoyed the afternoon tea service so much (aside from the annoying and constantly rushed service, it’s an excellent value) that I went back a week later with a good friend. …and found this little pocket-sized book! 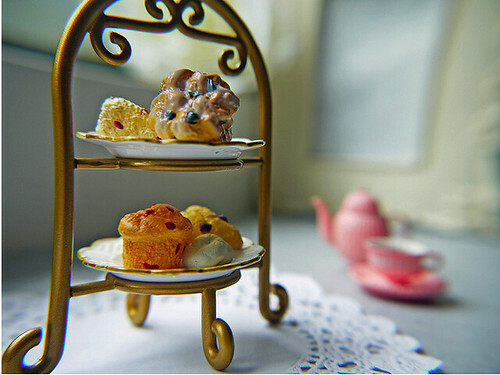 “Lady Mendl’s Afternoon Tea…Tips, Terms, and Traditions.” Isn’t it interesting? It was only $10 and I bought it without second thought. Here’s a peek at the back cover. Hope the week is going well for everyone! Walking home from lunch, I passed by Sullivan Street Tea & Spice Company. It’s a new shop from the owners of Grounded further in the West Village. Whereas Grounded is a coffee/tea/wifi spot, Sullivan Street Tea & Spice Company is strictly a dry goods store carrying salts, herb plants, and coffee in addition to a vast selection of teas. It’s a gorgeous space (which was was previously home to the Triangle Social Club run by the mob boss Vincent Gigante!) and worth visiting just for appearances alone. I was in a white tea mood and bought an ounce each of the White Melon and White Jasmine. I buy teas in small portions because I like to try different varieties and want to avoid having “stale” teas lingering in the cupboards. These teas were reasonably priced, about $4 an ounce. Both owners were at the shop – many thanks to Mark and Oliver who were patient to answer the million and one questions I had about different teas and herbs. There is much to learn…just the thought of it is mind boggling. …it’s a delicate, subtly sweet tea. Different teas trigger different memories, and this reminds me of afternoons in Hawai’i when my grandma would brew tea to accompany our daily afternoon snack. Hers was a stronger and more bold Green Jasmine tea but the basic idea is still there. As for the White Melon, I am cold-brewing it in the fridge overnight. Will add fresh mint and drink it iced tomorrow morning. Oliver suggested adding lemon verbena which I’ll try the next time around. So many possibilities! 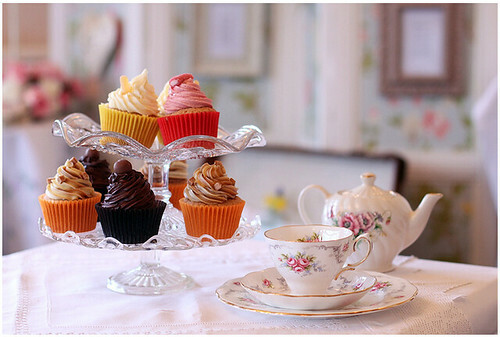 May We Have A Tea Party? 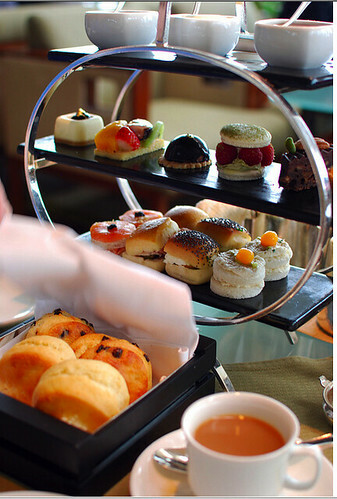 Search for the tag “afternoon tea” on Flickr and you’ll pull up hundreds of photos. Scenes from slow afternoons filled with teapot and scones. Sweets and savories. Could there be anything more beautiful? A few recent finds on Flickr – there are some beautiful photos out there. Variety, inspiration. Makes me want to run out for a porcelain three-tier stand, line it with buttery golden scones, perfect finger sandwiches. Petit fours, little opera cakes, itty bitty fruit tarts. Don’t forget the raspberry jam. Clotted cream. And the tea! Good thing my cupboards are well-stocked. Now I have an itch to start building a miniature tea collection…how tempting! Love the look of this tea stand. Sleek. Almost makes the classic tea stands look clunky. 1. Shave Ice on a daily basis. 2. 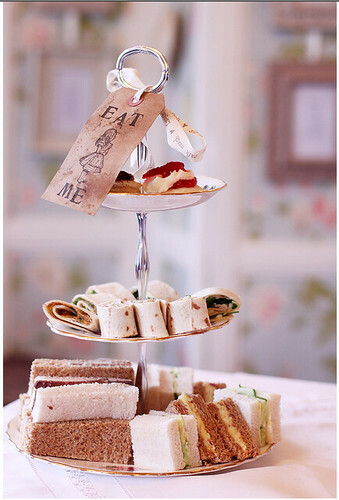 Afternoon Tea, all the time! The photo at top is Waioli Tea Room in Manoa, and this photo is from Moana Surfrider. Beautiful right? 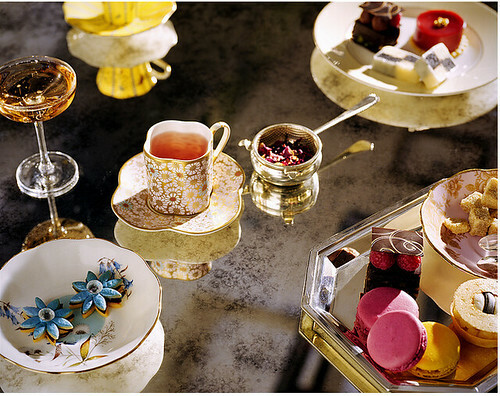 Afternoon tea in Hawai’i always feels so magical. Both photos were taken a few years ago – can’t wait to revisit these tea spots as well as other favourites: the Halekulani, Tea at 1024 and Kahala Hotel. A Cup of Tea opened in Kailua a few years ago…has anyone gone there yet? Afternoon Tea: Cucumber + Butter Sandwiches, Lemon Financiers, and Soba-Cha! Happy Saturday. I’m super excited about Afternoon Tea today because I bought my first package of Soba-Cha at Sunrise Mart earlier this week. We drank Soba-Cha often in Hawai’i, but I more or less “forgot” about it after moving to NYC. To pair, something classic and simple which would let the Soba-Cha stand out. So we have…Cucumber + Butter Sandwiches. Crusts off. A generous helping of room-temperature butter (the more butter, the better). Extra-thin cucumber slices. I used a vegetable peeler which worked well. Kyuri cucumbers. Japanese Kyuri cucumbers are perfect for tea sandwiches – very crunchy, no bitter flavor, small and thin with hardly any seeds. Then black pepper and sprinkle of sea salt. I made the first round plain, and did a second round with toasted sesame seeds. Will definitely keep the sesame seeds in the future…all the small things make the biggest impact! On the sweet end we have Lemon Financiers from Les Canelés de Céline. She also does them in vanilla and other flavors, but I most often go with the classics. Each financier is a single bite, almost too adorable to eat. Here’s a better look at the Soba-Cha. This 200g portion bag was $9.99 at Sunrise Mart. Soba-Cha = Buckwheat Tea. It’s made from roasted buckwheat and has an addictive, super nutty, somewhat malty flavor. Unlike normal tea leaves, you can actually eat the buckwheat. And this is my favourite part! Some of the buckwheat berries float to the top so you get little crunchy “bites” while drinking the tea. The rest sinks to the bottom and I just spoon them up after I’m done with the tea. To make Soba-Cha, I put about a teaspoon of the toasted buckwheat in the cup. Pour in the hot water directly over the buckwheat. And then if I want it more intense, I’ll put extra buckwheat into a bamboo strainer so I can control the intensity of each cup. I like my Soba-Cha very “bold,” while Monsieur P prefers it light. I poured out some of his tea into a ramekin so you can see how “light” he likes to drink it. We brew each serving of buckwheat twice, and by the end of the second cup, the buckwheat opens up and you can see the contrast of the white-colored interior to the roasted, dark brown exterior. So good to eat just like that! I went to Cha An (conveniently around the corner from Sunrise) to buy the bamboo tea strainer. This was only $1.50. What a good deal. Broadway Pandhandler also carries the same thing but they charge $2.